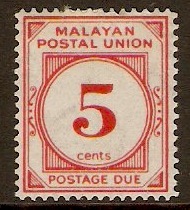 Home :: Malaysia and Malaya States :: Malayan Postal Union :: Malayan Postal Union 1945 8c Yellow-orange Postage Due. SGD10. 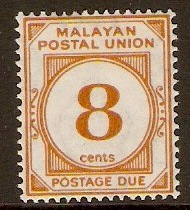 Malayan Postal Union 1945 8c Yellow-orange Postage Due. SGD10. Mounted mint 1945 8c Yellow-orange Postage Due. SGD10.